Welcome to Mai Mai Jewels. We believe that jewellery should be beautiful, colourful and fashionable and we therefore offer a unique collection of semi-precious and contemporary designed fashion Jewellery. Mai Mai Jewels are designed using the best semi-precious gemstones such as Citrine, Cherry and Strawberry Quartz, Honey Jade, White Jade, Amerthyst, Larimer, Citrine, Aventurine, Coral, Turquoise, Chalcedony and natural Crystal. Some of our jewellery designs are combined with jewel coloured Swarovski and Czech crystals teamed with charms and gold and silver chain. 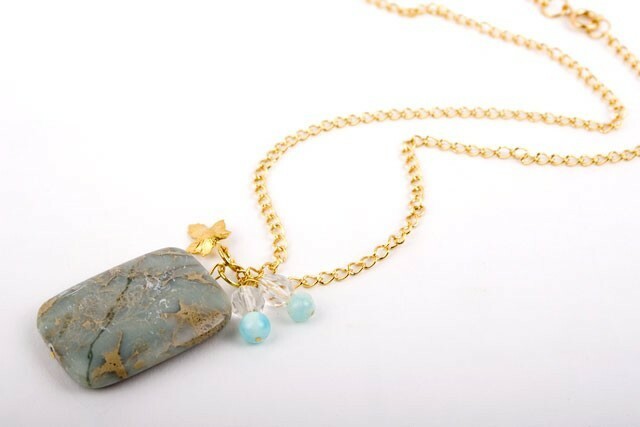 We combine the use of these semi precious stones and other materials to create beautiful pieces of jewellery which will make you feel and look amazing. Each piece of jewellery is handcrafted and designed in the UK. Our stones are sourced from around the world. Read about the Semi-Precious stones we use in our designs.